The owners of this property wished to make better use of the area previously occupied by a single garage, located to one side of the main property. 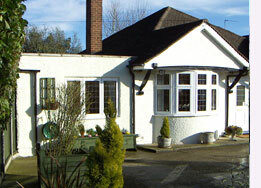 The garage itself was converted into a comfortably sized double bedroom, with the entrance aperture previously occupied by the double doors replaced with a single large window in keeping with the style of the building. There was still sufficient room for a lobby area and a toilet to the rear. The walls, floor and roof were brought up to standard using timber framework with Celotex insulation, vapour barriers, plasterboard and tongue and groove moisture-resistant flooring. 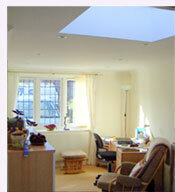 The inclusion of domed roof lights gave this conversion a truly light and spacious feeling.